[by Kim Ji Il] The transformation of webtoons, growing as global entertainment content, is endless. As the Korean webtoon industry has met its 10-year anniversary presently, popular webtoons are being reborn into different formats such as drama series, movies, plays, and even games, animations, character products, emoticons and commercials. Recently a lot of attention was given to an episode of SNL Korea where a webtoon writer and their work were starred in the show. What is the secret to the popularity of webtoons? People in the industry believe that webtoons intrigue their readers due to the easily readable content but contain well-made stories and transitions compared to foreign web contents works. Global readers have especially rated highly the differences that webtoon characters have from ‘manga’ or ‘comic’ characters. Therefore the government and several industries are starting to actively participate in the promotion of Korean webtoons through various exhibitions and promotion events containing the 10-years of webtoon history. 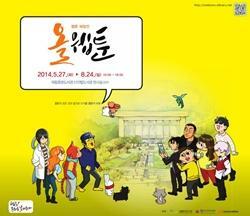 The National Library of Korea is holding a ‘Webtoon Exhibition-All Webtoons Exhibition’ from May 27 to August 24. 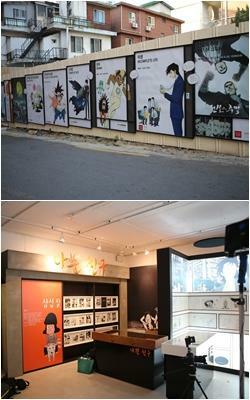 In this exhibition, visitors will be able to see 100 representative webtoons from the 10 years of Korean webtoon history. The exhibition is divided into six sections including ▲Flower of Stories, ▲The Mirror of This Century,▲A Flower Blossoming The Webtoon Culture,▲The Power of Webtoons,▲The Workplace Of A Webtoon Writer and ▲Dreaming of The Future of Webtoons. Tourists may experience the various stories of motivation and development of the webtoons and the way in which the works are produced and created. In addition, through a series of 6 talk concerts, visitors may meet the writers of the works. Specific details can be found on the homepage of the National Library of Korea (www.nl.go.kr). 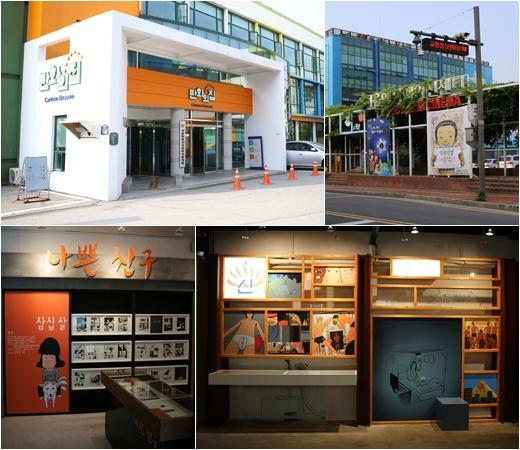 The Seoul Animation Center located in Yejang-dong, Jung-gu, Seoul not only serves as the pivot point for webtoons but for the entire Korean animation industry. 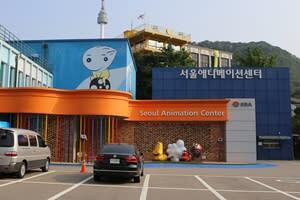 It holds the first animation theatre ‘Seoul Animation Cinema’ in Korea. The ‘House of Animation’ is one of the many different concepts of characters that can be seen at the experimental classes held. When you exit through Exit 3 of Myungdong Station and turn towards the right of the Pacific Hotel you will see ‘Zaemiro.’ Although a guesthouse is nearby, the traditional Korean aspects can be seen in the streets and the character exhibitions based on various themes add to the fun. Zaemirang located in the middle of Zaemiro is a cartoon culture space where the selling of character products and exhibitions are held in the basement, first, and second floor while working areas are provided for rising writers on the third floor. The fourth floor is provided for tourists to rest and read comics for free. The Lotte Department Store has collaborated with several popular webtoon writers to launch webtoon t-shirts. Being the second exhibition following the first in 2013, the exhibition will be limited to this summer season and will take place in all the Lotte Department stores. Consisting of different webtoon characters made by 13 different writers such as ‘Turn it around! Nonsense Cooking!’ by Jung Da Jung, ‘What’s there to know’ by Kim Jae Han, ‘The Gag Class That Does Not Laugh’ by Hyun Yong Min, the collaboration is made by printing the characters on the t-shirts of casual clothing brand companies such as Polham, Jack&Jill, and HUM and selling them.